I'm back! My Christmas break from blogging was a little longer than I planned. I traveled to southern California to spend Christmas with my parents and sister. I had an amazing time and while I didnt receive any Vera Bradley (they all guessed I had enough) I did give some away as gifts. First for my sister, I bought a Large Duffel and Large Cosmetic in Provencal. Erin doesn't have a lot of Vera Bradley, because that is my thing, not hers, but she seems to be warming up to it. She mentioned she liked Provencal and I might have gone a little overboard getting her two pieces. When she opened the present she said, "wow, that is a lot of yellow." 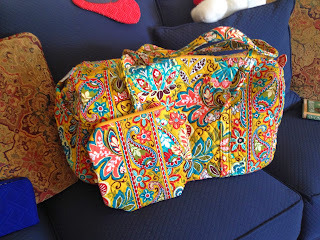 Mom insisted that she has enough Vera Bradley, but I knew there were a couple of things that I could get her without her saying she had enough. I was able to get two of the Christopher Radko Santa ornaments with a coupon Vera Bradley sent out (back when they sent out codes for varying percentages of savings). So I picked one up for each of us. She loved it and said what a beautiful ornament it is. 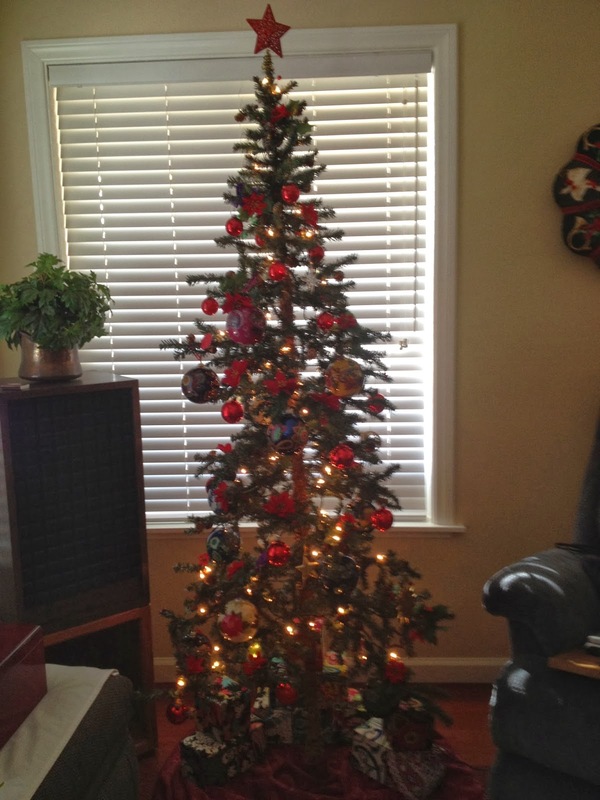 She has a Vera Bradley ornament tree with all of the hand painted ornaments from past years. She wasn't too thrilled with this year's Venetian Paisley glitter ornament, but seems to really like the santa. Note to Vera Bradley: bring back the old style ornaments. They are beautiful and go along with the collections we have all started. And while you are at it, please bring back the cloth boxes that we use to store them in. They are such a nice touch. I also picked up a Turn Lock Wallet in Cobalt because blue is my mom's favorite colors and the Turn Lock is her favorite wallet. I wanted to make sure I was able to get her one, so I picked one up as soon as they were available! She is currently using one in Deco Daisy, but it is only a matter of time before the cotton wears out. I had two of these mini kisslock coin purses, so I gave them each on in their stocking. Mom got Deco Daisy and Erin Viva La Vera! I hope you all had a Merry Christmas (or Happy Holidays!) and wish everyone all the best in the New Year! I can't think of a better way to end 2013 than with a giveaway! I picked up a Blue Bayou Zip ID Case during the preview and one lucky reader has the chance to win it before you can buy it! Blue Bayou, Citrine and Julep Tulip come out on January 9! Clementine is also considered part of the Spring line, but is already available in many styles. January 26th with be a follow up release with more specialty items like scarves, etc. February 6th will be the beach release! So to help ring in the new year and to celebrate the upcoming release of the Spring 2014 colors you can enter below to win the Blue Bayou Zip ID Case. 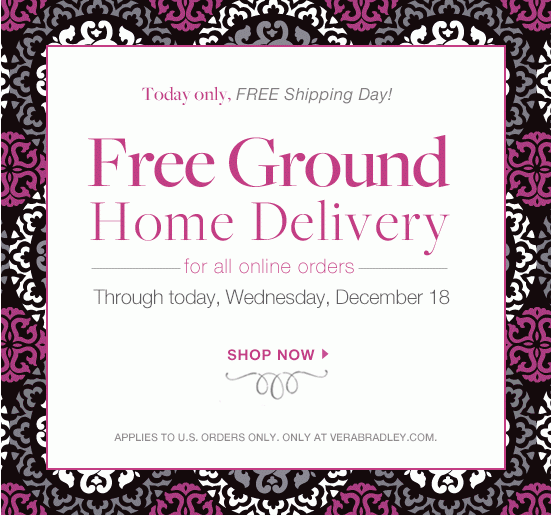 Vera Bradley has Second Day Air Shipping for $9.95 now through Friday, December so that you can receive your gifts in time for Christmas! 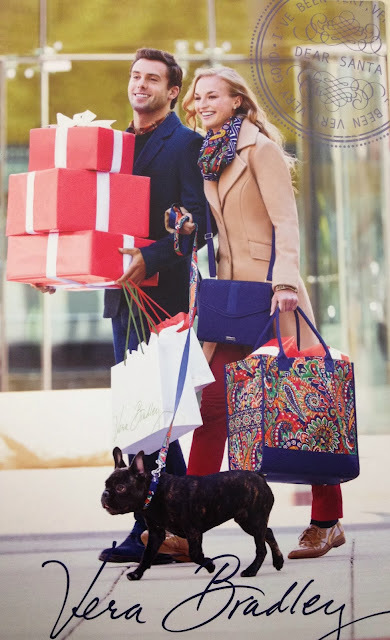 There is still time to do some last minute shopping! PLUS today only - take an additional 20% off sale items. The discount will show up in your shopping cart. Check out the Holiday sale items! Baroque, Go Wild, Marina Paisley, Va Va Bloom, La Neon Rose and Indigo Pop are 30% off. 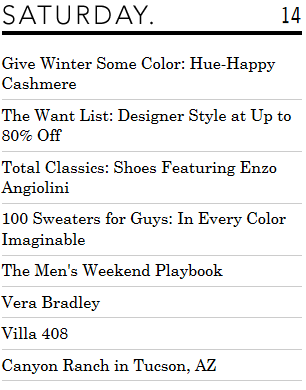 Remember to use Ebates to get cash back! 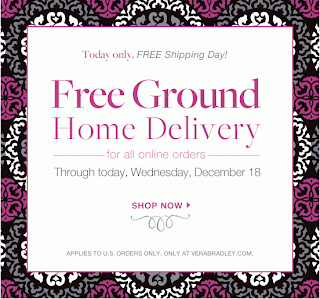 EBAGS has FREE two day shipping on their Vera Bradley bags, plus some bags are marked down! 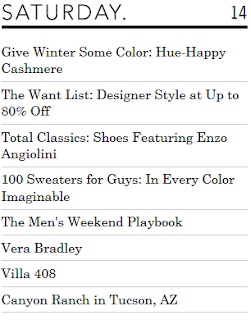 And you get 12% cash back through Ebates! 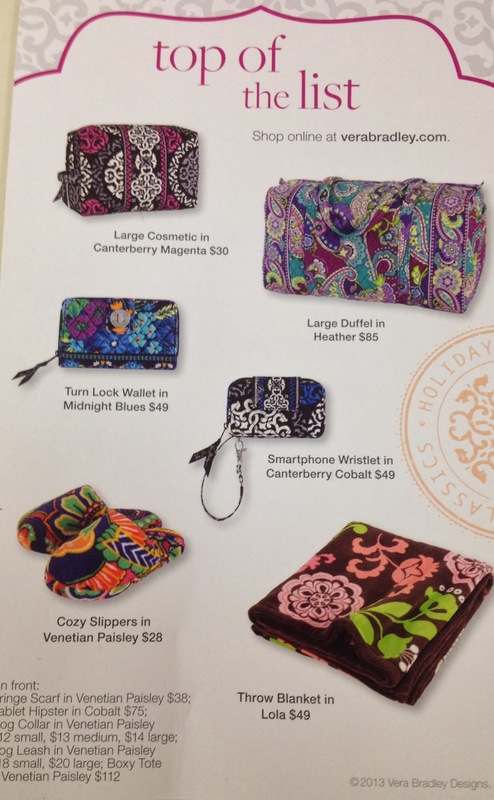 Here is the postcard marketing piece that is included in recent orders from Vera Bradley. 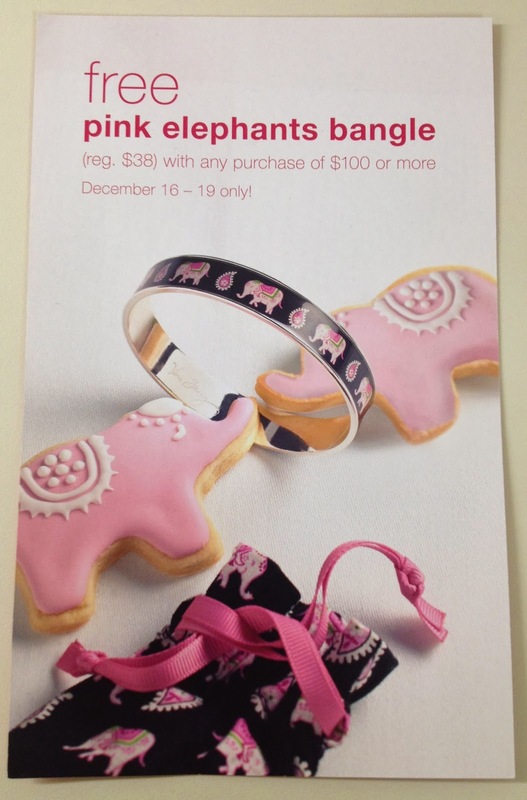 Free Pink Elephants Bangle with any purchase of $100 or more. December 16-19! Online and in stores. Still looking to pick up a few gifts for Christmas? Or maybe get something for yourself? Check out the Vera Bradley website daily, because they keep having great offers! Today you can save 50% on Paisley Meets Plaid, Dogwood, English Rose, Island Blooms and Suzani. PLUS if you spend $140 or more you can get a free Small Duffel (retail $69) And as always, remember to use Ebates to get cash back! Where in the World is Vera? 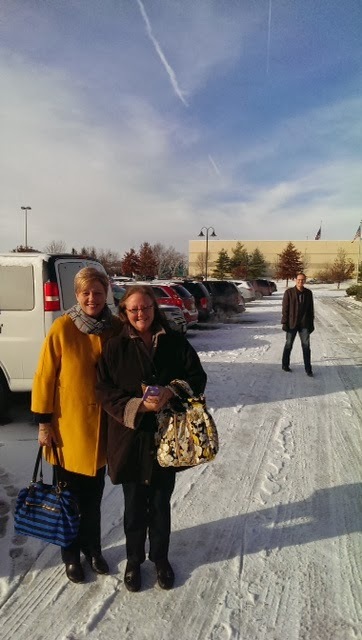 This time Vera is in Des Moines Iowa! OhMyVera reader Julie (Carrying a Dogwood Two Way Tote) was in Des Moines with her sister for her aunt's 90th birthday party. Stay warm Julie! 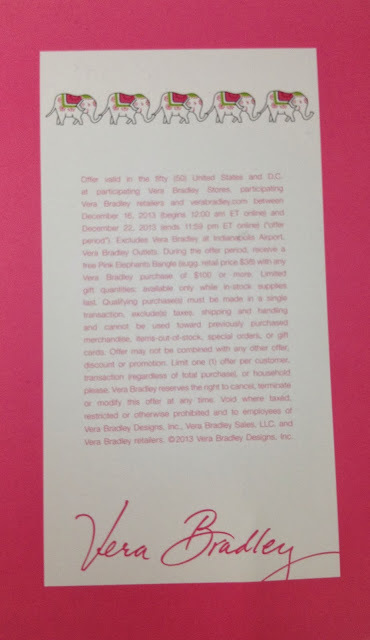 I ordered the Vera Bradley Sleek and Chic wallet from eBags when they posted it a little earlier than they were supposed to. I was excited to check out this new style wallet! Plus I love this bright cheery color. The wallet is 4" x 7" and retails for $38. First off, I totally forgot to take a photo of the front...oops. You will have to check out eBags or Vera Bradley to see the front. This is the back, it has a slide in pocket for anything you would want to easily get to without opening your wallet all the way. Hard to tell in this photo, but there was sticky gunk on the back of the wallet, so it got returned, bummer. When you open it, the bottom part stays snapped to the middle part. So you don't have to open it up all the way if you just need something from the top part of the wallet. Then you can store the cards you don't use as much in the part that is still snapped. I think that this wallet would work really well for me! I will have to try it out again later. For now I will just use the Accordion Wallet I have and maybe the free Turn Lock Wallet I am planning on picking up tomorrow night! Has anyone else tried it out? 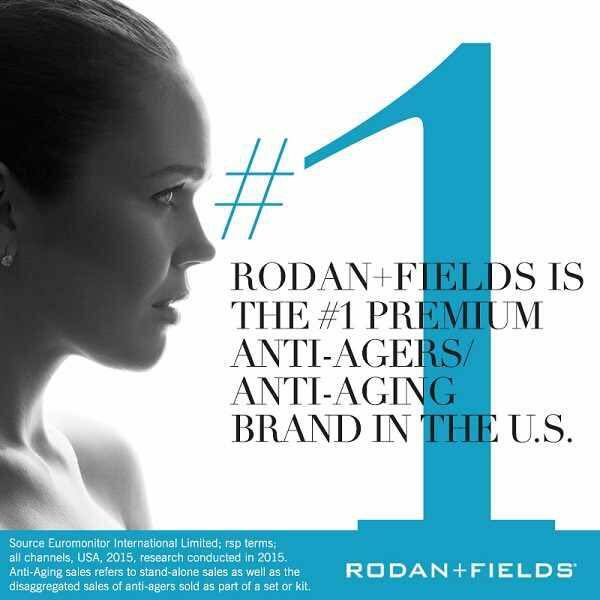 Leave a comment and let us know if you like it!